Despite being a faithful (if abashed) reader of celebrity publications like People magazine, I somehow missed the hubbub over one of my favorite pseudo celebrities (not): Kim Kardashian. She does have one thing going for her, however. She Twitters. Over 3 million people actually follow her tweets. That apparently gives her some degree of influence over the masses. 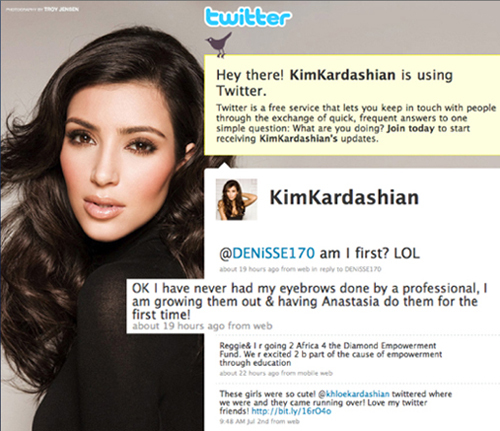 And so, in a new twist on a time-honored marketing ploy, Kim is now in hot demand as a celebrity endorser via Twitter. It’s called “sponsored Tweets,” a gentler term than advertising and presumably one that resonates more positively in an environment where authenticity supposedly rules. Kim is at the top of this particular heap and reportedly rakes in a cool $10,000 per tweet. She’s not the only “publisher” to do so – just for lesser amounts. Dr. Drew is a big draw and so is Lindsay Lohan and her ex, Samantha Ronson. Even business groups with a big following – the CBOE and Stock Futures Forecast – are registered as being available via the leading matchmaking platform, Ad.ly. The whole business raises a lot of issues relative to transparency and authenticity, the ultimate barometers of successful social media interactions. Ad.ly claims that the endorsed tweets it brokers are identified through the “#advertising” disclaimer at the end of each post. But a growing number of concerns are entering the fray and may not be so principled. And unfortunately, while the Federal Trade Commission issued guidelines on celebrity (and other) blog endorsements last year, requiring full disclosure, it somehow left the Twitter issue to fall between the cracks. I’d settle! And to that end I’ll need to build up my followers. Follow me at @sallyshodge so I can give Kim a run for her money. It’s kind of hard these days to escape how much digital communications have permeated our lives. Newscasters happily chirp: “Follow us on Twitter!” With-it seniors talk about how they have “friended” their kids on Facebook just to know what they’re doing, while their kids talk about blocking them from all but the most mundane conversations. We go online to research our purchases and make the buy. We eagerly await Groupon’s deal of the day’s arrival in our inbox. Snail mail’s dead; long live e-mail! As marketers, it’s our job to demonstrate how to make the most of the opportunities and challenges that lie within all these new channels. Our charge: Not just to build awareness but, importantly, to help them build their businesses. It would seem, however, that we communicators are pretty much talking to ourselves with all our articles, blog posts, presentations, what have you. There’s a lot of noise in our circles. But apparently, it’s not getting out to the people who need to hear. At least, in the small businesses arena, that is. 81 percent hadn’t explored social media. 47 percent see no value to Facebook, Twitter or LinkedIn for their businesses. 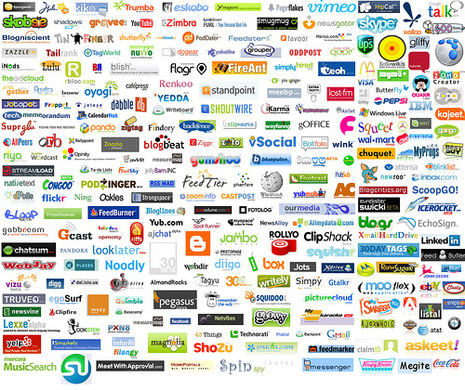 Nearly 40 percent of their businesses have no website. 62 percent don’t utilize e-mail marketing to promote their business. 84 percent haven’t engaged in e-commerce. How embarrassing is it to have been throwing a party that’s gone unattended by the most important guests? First, there are a lot of social media hacks out there. Businesses should be aware of the difference between professionals who truly understand the digital space and those who are really book (or article) smart. A campaign that is poorly designed is going to render lackluster results, and further delay broader adoption. Third, we need to be mindful of small business financial resources, and how that might fuel executives’ skepticism. This means we professionals would be better off starting small, measuring the results, and constantly fine-tuning to ensure the payoff’s there before venturing deeper into the waters. Finally, I also believe that the flexibility to offer “value added” services is an important differentiator for smaller agencies, and one that gives us far more latitude with our clients to experiment. All within reason, of course. If we worry a bit less about the hours and more about solidifying relationships, we can set up a win/win situation in proving out the value of integrating digital and traditional strategies. Technology advances have created exciting possibilities to connect more widely and deeply with various audiences. But the buzz is so loud that it may be distracting those who might benefit the most from the practical realities beneath it.